‘O ye who believe! when the call is made for Prayer on Friday, hasten to the remembrance of Allah , and leave off all business. That is better for you, if only you knew. The month of Ramadan is coming to an end. In places today is the last day of fasting and in places tomorrow will be the last day. And thus the fixed number of days of Ramadan will be over. Many among us would have attained the beneficence of Ramadan and would have gone through new spiritual experiences. Now the prayer and effort should be to make these spiritual experiences a part of life and steps taken towards God during Ramadan should not halt but should ever be onwards and upwards and may each of these steps garner limitless blessings. Today is Friday, a day vast majority of us regularly observe but there are also many who give a lot of significance to [only] the last Friday of Ramadan. The Jama’at is expanding all over the world and people from various sections of society are entering the Jama’at and their previous practices leave an impression. There will be some who will give special significance to the last Friday of Ramadan and consider that attending this Friday Prayer, which is called Farewell Friday, will be a means of salvation from their yearlong ills and perhaps by observing this Friday Prayer they will fulfil the dues of Fridays of the entire year. Even if such people are very few, Hazrat Khalifatul Masih reminded them that attending this Friday does not fulfil the objective of our life. It is evident from the sayings of the Holy Prophet (peace and blessings of Allah be on him) that only attending the last Friday of Ramadan is not a source of our salvation. Our youngsters and those who are negligent about Friday Prayers should remember that there may be a concept of Farewell Friday among non-Ahmadis, but in accordance with the teachings of God and the Holy Prophet (peace and blessings of Allah be on him) Ahmadis should not hold such a concept. Indeed, if a person attends the Friday Prayer on this day with special attentiveness, mindful of ridding himself of his weaknesses from today, then certainly this day and this Friday is of special significance. For him this moment of pure change will become Lailatul Qadr (Night of Destiny) for him; where he will enter into light after a night of darkness. As explained in last Friday sermon the Promised Messiah (on whom be peace) expounded that Lailatul Qadr is also the time of purification for a person when he turns to God. As the aforementioned verses clarify that God has drawn attention to attend Friday Prayers with righteousness and by putting everything else aside. There is no specific mention of Fridays during Ramadan or indeed the last Friday in Ramadan. Rather, the significance of Friday without any exception is stated and it is stated to leave off one’s businesses on the day and attend Prayer, stressing the significance of attending an important aspect of faith. Those who do not attend Friday Prayer with no warrantable/genuine excuse should be concerned about the state of their faith. Those who come to Friday Prayers late should also think about it. They should wrap up their work in good time to come to Friday Prayers. Everyone knows the fixed time of Prayers. In European countries people should leave a margin for travel time and be mindful of traffic and time allocated to parking the car. 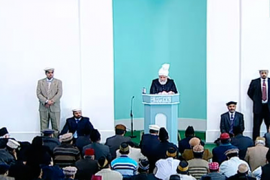 The Holy Prophet (peace and blessings of Allah be on him) said that those who come to Friday Prayers first are deserving of much spiritual reward. He said on Friday angels stand on each mosque door and they write names of those come first to the mosque at the top of the tally and prepare a list of those who come to the mosque until such time that the imam finishes his sermon. This is when the angels also close their register. Each person coming to mosque for remembrance of God gains spiritual reward. The Holy Prophet (peace and blessings of Allah be on him) specifically warned against not giving importance to Friday Prayers and said that whoever knowingly leaves three Friday Prayers has a seal set on his heart by God. Thus, neither God in the Holy Qur’an nor the Holy Prophet (peace and blessings of Allah be on him) laid emphasis on the last Friday of Ramadan. Rather, all Fridays are of significance. The Holy Prophet (peace and blessings of Allah be on him) said God has made Friday a day of Eid for you. You should bathe and get yourself ready on this day. This demands that we take time off from everything on Fridays and go to the mosque. Ahadith show that Friday Prayers are obligatory on every believing person in order to raise their standard of faith. Likewise the negative aspect of those who are negligent of this is also stated. It is cause for grave concern for them and they should self-reflect on the matter. Islam is not a religion which only prescribes strictness; it is not simply about warnings. In fact if there is a genuine excuse then one can miss Friday Prayers, but missing them without genuine excuse is not allowed. The Holy Prophet (peace and blessings of Allah be on him) said that Friday Prayers are obligatory on all Muslims with the exception of slaves, women, children and the sick. If women go to the mosque to attend Friday Prayers it is a good practice but not one that is obligatory for them. Some women attend with little children who can cause disturbance. Young mothers should not come to the mosque with their children as they can cause disruption in Prayers for others. And some women have other domestic things to take care of so they do not attend Friday Prayers. Indeed, only Eid Prayers are obligatory for women, even for those who are not offering Salat on the day. Likewise, slaves are subjugated to their masters. These days no one is enslaved in the real sense. Working people do not come under this classification apart from in exceptional cases where employers do not allow leave and there is no other means of livelihood and there is danger of matters leading to starvation. This is a critical state of affairs. However, such a state is not common if employers are made to understand they can give leave perhaps every alternative Friday. Many Ahmadis have left employment where leave was not given on Fridays and have found better employment with the grace of God. The Holy Prophet (peace and blessings of Allah be on him) brought the last perfect and complete religious law. He wanted to see very high spiritual standards of his followers. He drew our attention on how to avoid sin, on how to attain nearness to God and on how to fulfil our objective of existence. The Holy Prophet (peace and blessings of Allah be on him) said that one Salat (of the five daily Salat) till the next Salat, one Friday till the next Friday and one Ramadan till the next Ramadan become a means of expiation for a person as long as he avoid big sins. A person who offers Salat and is mindful of the next Salat he has to offer later on will not indulge in anything sinful and unfair or something that would usurp others. And if he does then his Salat is not true Salat and he is committing grievous sin. He would not have offered his Salat for God and would not have offered it being mindful of his sins. Salat of such people cause their ruin and according to the Holy Qur’an rebounds on them. Our attention is drawn to the obligatory five daily Prayers, similarly attention is drawn to Friday Prayers. The sense of piety garnered by attending one Friday Prayers should be maintained till the next Friday. In such a situation one Friday till the next will deliver one from sin and be a source of pardon. Thus the significance of every single Friday is stated. Similarly the significance of Ramadan is stated. It is indeed essential to fulfil the dues of Salat, it is important to fulfil the dues of Friday Prayers and the dues of Ramadan. Garnering beneficence of these when offered with the stipulated conditions saves one from sin and enhances one in piety. Thus God gave us a daily modus operandi, a weekly modus operandi and an annual modus operandi for spiritual reformation. One who surpasses these degrees will be granted forgiveness. God has placed Ramadan as an annual means of our spiritual betterment and not any single Farewell Friday. As for seeking beneficence of Friday, the Holy Prophet (peace and blessings of Allah be on him) said every single Friday is of beneficence and is a means of forgiveness. Each Friday should bear witness before God that a person spent the intervening days with fear of God and did not knowingly do anything that displeases God. Each Friday would then bear witness that this person generally tried to spend his time with fear of God. Similarly, if daily Prayers are offered to seek God’s pleasure they would bear witness in our favour and it is the same with fasting during Ramadan. This alone is meant by expiation that these acts of worship bear witness in our favour and become means of our forgiveness. Citing the beauty and importance of Friday the Holy Prophet (peace and blessings of Allah be on him) said Friday is the best day among days. Invoke durood (salutations) profusely on me on this day; durood invoked on this day is presented before me. This of course is yet another universal blessing of Friday. It is not stated anywhere that durood invoked on the last Friday of Ramadan will be presented before him. Fortunate are those who avail of this beneficence. Bless O Allah Muhammad and the people of Muhammad as You did bless Abraham and the people of Abraham. Prosper O Allah Muhammad and the people of Muhammad as You did prosper Abraham and the people of Abraham. Everyone should try and seek these blessings of Friday. God states fulfil the dues of Friday keeping its significance in view and putting all other engagements and business aside. This will garner you spiritual benefits but in order to garner material benefits return to your engagements and businesses after Prayer and seek God’s blessings. Indeed, God will bless your businesses. This tells us that it is indeed God Who blesses everything. If a small sacrifice of time is made for His sake on Friday, He will bless your businesses. He possesses all power and makes good everything, He will make good any loss and will bless. Thus for a true believer earning a living is also a blessing of God. Work hard at your business after Friday Prayer and do so while remembering God and doing your worldly business in accordance with God’s will. There should be nothing contrary to God’s will in what you do because that would be disregarding remembrance of God. As mentioned last Friday, we should be mindful no matter what we are doing that God is watching us. This will fulfil the dues of His remembrance as well as the dues of our responsibilities. Any special significance today may hold would be that either today or tomorrow we depart from worship of Ramadan but we are not departing from worship of Friday. Next Friday will be just as important as today is. Meanwhile we should try and remove our weaknesses. This way we will be bidding farewell to our weaknesses and will not be bidding farewell to Friday! We should neither think that we bidden farewell to Friday nor should we think that we have bidden farewell to Ramadan. Such thoughts would take us away from the objective of our creation. And one who is distant from objective of our creation is distant from righteousness and one who is distant from righteousness cannot attain God’s blessings. As if we would ourselves dissipate anything we had tried to attain during Ramadan and would be deprived of the success and prosperity that God has promised with Ramadan. God has said that the consequence of fasting in Ramadan is righteousness. Today we need to reflect whether we have attained this or not or at the very least have we taken some steps towards it. Did we promise to stay steadfast on whatever we achieved during Ramadan and will we make efforts to further enhance in it. The Promised Messiah (on whom be peace) said read the Holy Qur’an again and again and make a list of all that is forbidden in it. Then try with God’s help and grace to avoid those ills. This is the first stage of righteousness. This alone does not gain God’s pleasure. Indeed, evil should be avoided and should be replaced with pious acts; there can be no sincerity without this. One who is proud of the fact that he does no evil is foolish. Islam does not take man to this stage and lets off; in fact it wants man to fulfil both clauses. That is, completely abandon evil and practice piety with absolute sincerity. Salvation cannot be attained without both these aspects. This Ramadan, Friday and our worship should make us realise that while we have abandoned evil as the first stage of righteousness, we also have to embark on the next stage of righteousness and fulfil all pieties with absolute sincerity. It should not be that we should feel proud that we have become regular in Salat and after saying Salat while still in the mosque we start criticising others or talk about matters which have nothing to do with piety. This way we would not have even traversed the first stage of righteousness! The Holy Prophet (peace and blessings of Allah be on him) said that an hour comes during Friday when prayer is accepted. We should especially pray that we leave this Ramadan having completely given up evil and having adopted piety with sincerity and that we truly abide by righteousness. May we fulfil the objective of the advent of the Promised Messiah (on whom be peace) and take the beautiful teaching of Islam to the world and tell them that Islam is the only religion that connects man to the Living God and this is the religion which draws attention in the most excellent manner on how to fulfil rights of each other. May God enable us to do this! May God relieve Ahmadis who are engulfed in difficulties, may He remove their worries. May God enable the Muslim Ummah to recognise the Imam of the Age and be relieved of their pain and problems! May God stop them from the cruelty they are perpetrating against each other so that Islam may manifest itself in its true glory in each Muslim country!